The smartphone revolution has already remade a bunch of industries: software, music, and even transportation have all been irrevocably altered by the fact that more than a billion of us now carry a powerful internet-connected computer with us at all times. The next industry to go is advertising. 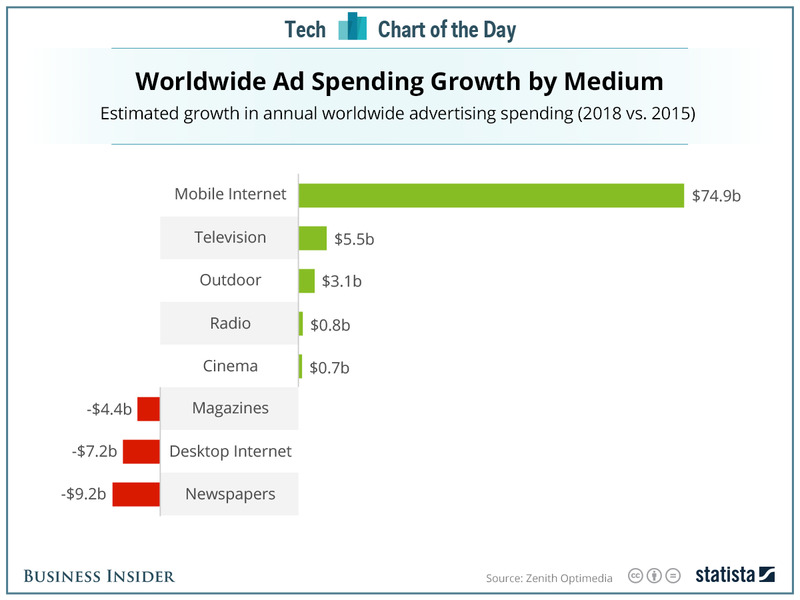 Zenith Optimedia predicts that advertisers will spend almost $75 billion more annually on mobile advertising in 2018 than they do today. 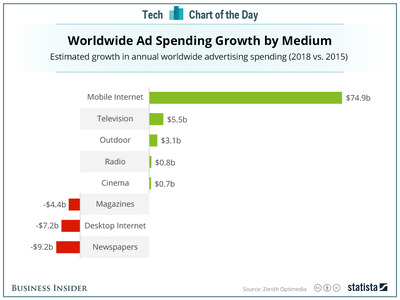 No other segment will see anywhere close to the same growth, and advertising in newspapers, desktop web content, and magazines will continue to plunge. The two companies best positioned to capitalise on this growth today are Facebook, which owes nearly all its revenue growth in the last four years to mobile advertising, and Google, which has a strong advertising platform for the mobile web. This is also why Verizon is making big investments like buying AOL, whose mobile advertising strength was attractive, and increasing its video content.